Epoxy Coating Transforms Boring Flooring! You don’t have to settle for plain concrete, tile or dull carpet any longer! Satin Finish Concrete teamed with American Epoxy to bring a fresh, modern look on any flooring space inside or outside of your home or business! An epoxy floor coating may be the answer to turning ho-hum flooring into a snazzy showpiece. While epoxy flooring isn’t new, it provides a fun way for homeowners to show their flair for creativity and style. There are endless colors you can choose from! If you are looking for a change, give us a call! We would love to help you create any look you desire! SATIN FINISH CONCRETE AND OWNER PETE AJELLO ARE NOW FEATURED IN NEW NATIONWIDE MAGAZINE!! We are proud to announce that Pete Ajello Owner Of Satin Finish Concrete was asked to be a part of a new magazine called " Healthy Miami" to add to its list of Nationally Publicated Articles and inserts showing off the Art of epoxy flooring along with before and after photos of Intetior/ Exterior Painting of Luxury Homes followed by his #1 rating in South Florida for Terrazzo and Marble Restoration.
" Healthy Miami Magazine" is a monthly publication available everywhere. Peter explained his presence in the magazine located on page 33 as a healthy gift for the Holidays, and like any gift, Peter accepted it with love and gratitude adding it to his personal and business life experiences and Journey. Peter, says " This is the type of moment that makes me feel like my hard work pays off, I thought surviving a diabetic stroke, and losing 200lbs without any surgery was a difficult task, owning " Satin Finish Concrete " has been challenging as a small business owner upcoming my 5th year in the world of Flooring and Painting. We have come a long way inch by inch just like my weight loss and am very proud today of my workers and company moving forward into 2017. Peter Ajello is the owner of Satin Finish Concrete and also an Author to several books " Mind Over Body " Pain , Passion, and Purpose " " The Chocolate Diet" and has been featured on " The Dr's Show, Oprah Winfrey, and Dr. Oz. Satin Finish Concrete Puts the ‘Fabulous’ in Flooring at JM Honda! Satin Finish Concrete is pleased to have teamed up with JM Honda of Miami to design beautiful epoxy chip floors for the service area of their expansive Miami, Florida location. Upon completion of the job, JM Honda asked Satin Finish Concrete to help them create a metallic epoxy finish for the flooring in their new motorcycle showroom. We were happy to oblige, and created a look utilizing Honda’s signature colors to deliver the exact finish they had in mind! JM Honda is located at 1600 S. Dixie Hwy in Miami, Florida. Stop by their beautiful Miami location, or visit them online at www.jmhondamiami.com. They have a wide variety of cars and motorcycles from which to choose. The staff is very friendly, and the service is outstanding! Satin Finish Concrete Finalizes Colorful New Entrance to Xtreme Action Park! specialized needs of Xtreme Action Park, and exceed their expectations in the process. Please click on the following link to view the results for yourself! of our diverse applications, and includes full-color before-and-after photos of our interior and exterior projects. Pete Ajello And Dan Bowman Are Sweeping The Country With A New Concept! Now You Can Have Your Cake And Eat It Too! Satin Finish Owner Peter Ajello Unveils Beautiful Terrazzo Floors for Local War Hero! Peter Ajello has appeared on the Oprah.com podcast, Lifecast with Bret Michaels, The Doctors, Dr. Oz, Today, NBC and Fox News. During that time, Peter has met a host of famous artists, musicians and celebrities but this past week, however, a chance meeting with decorated Iraq War veteran and former 1st Lt. Miguel Santana has proved to be among the most memorable and poignant of all. As the owner of Satin Finish, a Fort Lauderdale, FL company specializing in terrazzo, epoxy, marble, concrete, flooring and painting services, Peter Ajello was called to assess a project at a Fort Lauderdale property owned by Miguel Santana. A close inspection revealed that the floor appeared to have beautiful terrazzo under all of the tile and dirt. Peter provided Miguel with an estimate, along with an introductory package that included licenses, insurance, references, and links to before-and-after pictures and videos on YouTube and Facebook. Peter strongly feels this is a prerequisite in an industry rife with so-called flooring, concrete, tile and painting ‘specialists’ lacking proper documentation, licensing, insurance and integrity. After accepting the offer, Miguel sat down with Peter, and they began chatting about their lives and families. After sharing their respective life-and-death experiences, Peter was awestruck to be in the presence of a war hero who fought brutal missions and saved many lives as part of the 1st Battalion, 36th Infantry Regiment in Ramadi, Iraq, a hotbed of insurgent activity during the Iraq War. Since Satin Finish employs the #1 terrazzo and marble installers in South Florida, Peter dispatched top installer Andres Sandoval, who has been with Satin Finish for the past five years, to immediately commence work on the project. This particular project took an extra few days, as there were many deep stains. Andres was able to remove the stains without leaving even a single ghost line where the tile existed; the mark of perfection on such a project. At the conclusion of the project, Miguel and his lovely wife were thrilled at the outcome, and Peter was both honored and proud to perform work on behalf of such a brave and humble soldier! As we approach the 15th anniversary of 9/11, Peter and the entire Satin Finish crew would like to honor those who perished in the attack, along with all of the brave soldiers and fallen heroes past and present who’ve valiantly protect our nation, the world, and its people under the harshest and most dangerous conditions. Satin Finish Concrete takes Pride in Documenting all of our projects with before and after full HD video and pictures to share each floor and project as it is seen through the eyes of Celebrity Pete Ajello as an art. Peter has been on over 5 National TV Shows and is a people person who loves the camera so is a perfect fit for your viewings and commentary on our new Satin Finish Concrete YouTube Channel. Peter and Satin Finish Concrete have been doing this for quite some time now and have over 100 videos to share for your next project or just entertainment, Satin Finish offers over 75 to 100 references of all local projects here in South Florida that come with there introduction package which also contains there licenses and insurances which is a tough thing to find in Florida, and separates them from the rest of the Cowboys out there trying to keep under the radar without proper paperwork or an established company. Contact Peter Ajello for a free estimate for epoxy concrete flooring, Terrazzo and Marble restoration and interior or exterior painting 954-678-8160. So we invite you today subscribe to our channel on YouTube and enjoy our videos. Also feel free to check out Peter's personal YouTube station with over 300 inspirational videos and National TV Appearances. Satin Finish Concrete takes Pride in Documenting all of our projects with before and after full HD video and pictures to share each floor and project as it is seen through the eyes of Celebrity Pete Ajello as an art. Peter has been on over 5 National TV Shows and is a people person who loves the camera so is a perfect fit for your viewings and commentary on our new Satin Finish Concrete YouTube Channel. Peter and Satin Finish Concrete have been doing this for quite some time now and have over 30 videos to share for your next project or just entertainment, Satin Finish offers over 75 to 100 references of all local projects here in South Florida that come with there introduction package which also contains there licenses and insurances which is a tough thing to find in Florida, and separates them from the rest of the Cowboys out there trying to keep under the radar without proper paperwork or an established company. Satin Finish Concrete are not only crushing South Florida with their beautiful terrazzo, marble and epoxy floors, they also do painting! Pete Ajello started Satin Finish Painting two years ago knowing it would be a success! They cater to any residential or business interior or exterior, Satin Finish Painting will meet any of your painting needs! We have done many projects with our top of the line paint and expertise lead by the Satin Finish team! We are excited to announce that we are now be hired all over the state of Florida and just keep expanding! Our latest project is a business located in East Fort Lauderdale, Affordable Home Health Care is a company dedicated to providing the best care at the best prices. This is a full service agency with 24 hour availability, when they contacted us, we were more than happy to add this to our list of projects! They called us in to give their brand new office a brand new paint job! The Satin Finish team made them very happy customers! To follow, they will be doing metallic floors, which we will feature next week! Make sure to give Pete a call for a free estimate whether it's painting, epoxy, marble or terrazzo restoration, we do it all! Your floors could be next! Owner of Satin Finish, Pete Ajello and American Epoxy Do it Again!! For All You Cat and Dog Lovers, Get Ready for A New Trend Across Florida! For those of you who love your cats and dogs, Peter Ajello and Dan Bowman, owners of Satin Finish Concrete and American Epoxy have joined forces again to create a unique Epoxy blend for a chain of stores catering to all your pup's and feline's appetites! Meals for Dogs is about to hit Florida in a big way!! Meals for dogs is a growing team of dedicated people striving to make their company a source for good, healthy canine meals in a loving, family-style commercial kitchen. Their recipes are South Florida inspired and will be sure to transform the way you feed your furry friends forever! The grand opening should be in 4-6 weeks, so come take care of your pets and check out our new floor at the same time! Like Pete Ajello would say, "Your Floors Could Be Next!" As Pete Ajello would say, "Life is all Mind Over Body," and loves taking pride in each project as he is grateful for every day of his life after a near death experience. Stop in our office and say hello! You can read more about Pete's personal journey at www.PeterAjello.com. Peter has been on the Emmy award winning Doctor's show, Dr. Oz, Japan's The Best House123 on Fuji TV, Live Healthy With Adam Kuperstein, NBC, Fox News, Australia's The Jackie and Kyle O Today Show, Oprah's Life Class as a guest of Brett Michaels and in thousands of international articles. Please visit our office, conveniently located at 1340 Stirling Rd. Suite 1A in Dania Beach, Fl 33304. We would be more than happy to accommodate your flooring or painting projects! We also specialize in Terrazzo and Marble restoration, along with Exterior and Interior Painting. Satin Finish Concrete Ranks #1 in South Florida in Epoxy Flooring and Painting! 6-3-2016 - Satin Finish Concrete Ranks #1 in South Florida in Epoxy Flooring and Painting! Peter Ajello has single handedly achieved the unachievable within only months of starting the Epoxy Flooring and Painting division at his company! The determination and dedication that he puts into his business is paying off, and shows just how big his empire has grown from the beginning! tell the story of the American Dream. In the early 1980's, the Molina Family humbly came from El Salvador to the United States with the dream of making a future for the family. 12 brothers and sisters of the Molina Family. Today the Restaurant has 5 locations, the largest of which seats 234 people having one brother in the kitchen and one sibling in the dining room of each location. The family grew even stronger as the siblings were able to work together at this first location. Because they are now spread out working at the five different locations, each of the family members have grown to appreciate one another more than ever, since they don't get to see each other every day like in the beginning. Satin Finish Concrete was given the honor of installing the Epoxy Flooring at their Fort Lauderdale Location. Their Epoxy Flooring not only tops off the pro look but also resists grease/oil stains, beads water, and wipes clean like a kitchen counter. Color chips and custom paint colors hide annoying imperfections in the concrete, and anti-skid additives give you the grip you need on the restaurants flooring. The fact that Satin Finish Concrete has added the Painting division, has made it extremely easy and efficient for residential and business owners to build or remodel as they do not need to search and deal with different companies for each scope of work which can be extremely time consuming and sometimes darn right annoying to deal with. Not only that, but Satin Finish Concrete/Painting always gives the client a discount for doing both jobs in house! They just recently finished removing the popcorn ceiling of a home located in Governor's Point and applied a knock-down texture which really opened up the home beautifully. It is amazing how such a simple thing as the removal of popcorn ceilings can transform a home into an amazing living space! Most homes, whether new or pre-owned, are originally designed to attract potential homeowners, and the best way to draw people into a house is to make it look like they could possibly live there. To do this, home builders and realtors intentionally create a neutral look, which means light-colored carpets, wood cabinets, beige countertops, and most importantly, there're going to be lots of white walls. However, when you move into a new house, you want to make it feel fresh and comfortable, and there's nothing more boring and lifeless than being surrounded by drab interior painting. Get the White Out Never underestimate the power of a fresh coat. Though white walls can certainly open up a space, if every surface lacks color, it can also feel claustrophobic. They can be neutral and modern, but white walls also tend to look institutional and impersonal. Plus they're hard to keep clean and they quickly reveal any imperfection. You always want your home to feel, well, homey. And the only way to do this is to give your walls a splash of life. And don't fear brave color choices: bold statements often lead to pleasing results. Did you know that your living and working environment can actually affect your physical and mental health? A fresh coat of paint, and just the right color can actually bring the serotonin levels in a brain to spike, creating happiness within yourself and create a serene environment for you which distresses the body! Do yourself that favor and make yourself happy by calling Peter Ajello at Satin Finish Painting for a FREE Estimate at 954-678-8160! Check out Peter’s affiliate company website at www.SatinFinishConcrete.com for epoxy concrete flooring, Terrazzo and Marble restoration and interior or exterior painting 954-678-8160. Satin Finish Concrete are smashing South Florida. Peter Ajello owner of Satin Finish Concrete and also a national weight loss celebrity that has appeared on shows such as The Doctors, Oprah, and Dr. Oz. He is surprising the country with his absolutely beautiful State of the Art Epoxy Flooring. A combination of years of expertise of Epoxy installation and flooring techniques, and strong persona to deal with clients and manage the projects, it is a dueling recipe for success! Concrete Polishing is now a fading fad as over time, even the best concrete floors begin to deteriorate and revert back to the ingredients comprising concrete, (sand, gravel and water), causing divots, cracks and chips. A professionally applied epoxy floor will seal and protect the concrete from elements that break down the floor as well as provide an easy to clean, aesthetic appearance. This ultra-unique flooring infused with innovative design is sure to make a bold statement in any room has a reputation for satisfying customers seeking extraordinary results and awe-inspiring envy! Once applied to any existing hard surface, the epoxy floor coating will retain a high gloss finish which resists stains, chipping, peelings, and fading. The floor surface texture can be made to your specification, as smooth or textured, as you like. On another note, Satin Finish Concrete's client, Igor Araujo, who is a world premier hair stylist and the owner of Ouiddad Flagship Salon was so impressed with the Metallic Epoxy Flooring that was installed in his brand new salon located in Fort Lauderdale, that he gave Satin Finish Concrete an amazing gift as a thank you by featuring them in Healthy Magazine! Born in Brazil, Igor Araujo brings the passion, energy and zest for life of that cultural region to his work. Igor gravitated toward hair coloring from an early age and has perfected his craft to such a high level of excellence that he is both a Ouidad Certified Stylist, highly knowledgeable about the sculpture of curly hair, and a Goldwell Technical Artist, for which he travels to Goldwell’s Academies in New York, Los Angeles and Baltimore to continually learn more and raise the bar of his coloring skills. I would highly suggest making an appointment with him if you are looking for an outstanding stylist! Check out Peter’s company website at www.SatinFinishConcrete.com. 3-30-16-Satin Finish Concrete has been serving the community of Wilton Manors for years! Their most popular project was The Wilton Manors Historical Society. The Wilton Manors Historical Society was originally formed in 1975. The Society was re-launched as an independent entity in 2002 following periods of activity and dormancy. On November 15, 2002, the State of Florida formally recognized them as an incorporated non-profit organization. 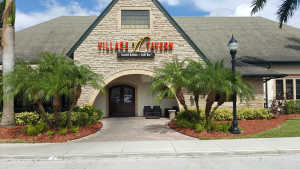 There Mission Statement starts off with the fact that they are "To collect, preserve and interpret Wilton Manors history and promote public awareness and appreciation for the rich past of the Island City." Currently, they are leading the project to restore and re-purpose the mid-1920’s Willingham Carriage House at Richardson Historic Park and Nature Preserve. Satin Finish Concrete believes in the same ideals and concepts. Restoring historic or modern homes, starting with the floors! The last project in Wilton Manors was the installation of White Metallic Epoxy flooring with added Glitter on the covered patio owned by Tony Falcone. The client was so happy with the outcome, that he has invited anyone whom wishes to see it, to do just that with a cocktail in hand! SFC specializes in turning ordinary looking concrete into the extraordinary, with their revolutionary flooring systems. Their products protect your flooring investment and enhance it by offering the highest quality floor coatings available to the market. SFC meets industry standards and can conform to any specification. They are committed to delivering nothing but the very best solution for your needs. Their environmentally friendly techniques for cleaning, resurfacing, and sealing natural and man-made stone surfaces are state-of-the-art and unsurpassed for effectiveness, economy, beauty, and durability. All of their craftsmen are professional, courteous, and have many years of experience. Satin Finish Painting's New Commercial Hits South Florida Channels, along with Peter Ajello's Engagement! Check out his company website at www.SatinFinishConcrete.com, or contact Peter Ajello for a free estimate for epoxy concrete flooring, Terrazzo and Marble restoration and interior or exterior painting 954-678-8160. March Madness is a Complete Success!! Satin Finish Concrete expands by Creating a Painting Division! 3-10-2016 - Satin Finish Concrete, Terrazzo & Marble Restoration, Inc. has expanded the corporation by adding a painting division for interior and exterior painting of residential homes and businesses. All of their painting projects, whatever the size or budget, are carried out with the highest possible degree of care and attention to detail with outstanding customer service. With their extensive knowledge, executing the clients specifications, color schemes and budgets enable the client to achieve the desired interior or exterior look and finish for their home or company. The painting division has now brought in over 23 jobs, and continues to grow. Each project is planned carefully to ensure the work is carried out to a high standard, and with minimum disruption to the clients home, or business operation. President, Peter Ajello is keeping an amazing balance between his celebrity status, Mind Over Body company, Satin Finish Concrete, Terrazzo and Marble Restoration, Inc., and now the new expansion Satin Finish Painting. It is no wonder that these businesses flourish, as the president himself has had a near death experience which contributes to his determination, outstanding performance, amazing work ethics, and complete success! 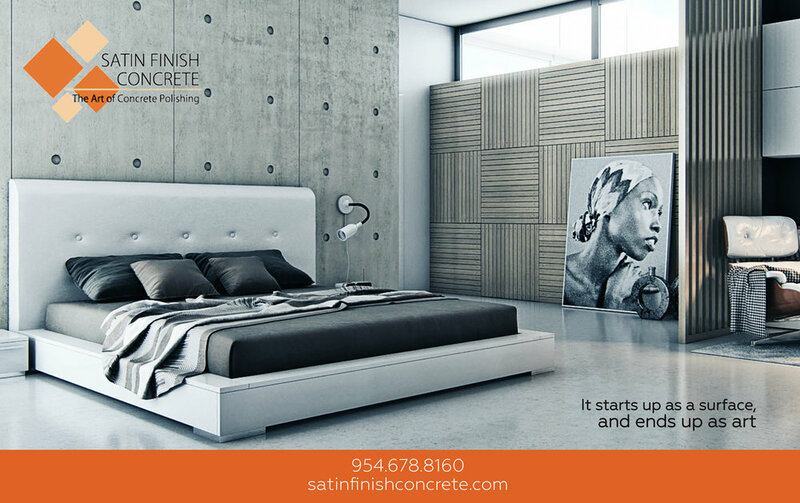 Check out his affiliate company website at www.SatinFinishConcrete.com, or contact Peter Ajello for a free estimate at 954-678-8160.